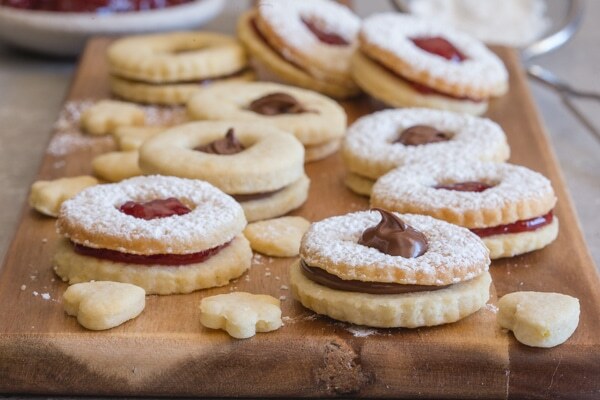 Italian Sandwich Cookies, a thin buttery cookie filled with your favorite filling, from a creamy Hazelnut filling to a little Jam or chocolate frosting. You won’t be able to stop at one! 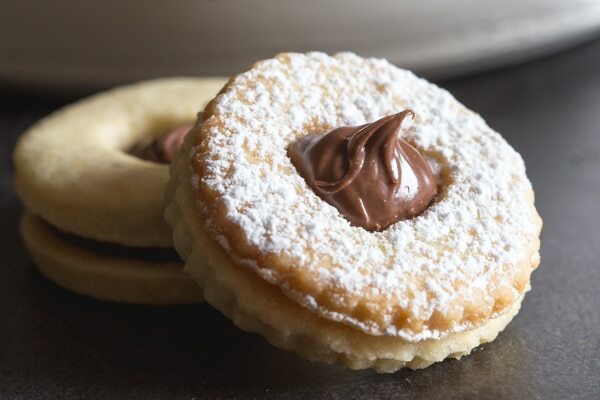 Whenever I went to the bakery here in Italy my eyes and of course those of my kids would immediately go (and they still do) to these buttery Sandwich Cookies or as they are called here, Occhio di Bue (Bullseye). I would usually buy a couple, naturally the ones filled with that creamy Hazelnut Filling, until I decided to make my own. I have been perfecting this recipe over the past few years and I have to admit these are the winner. Thin buttery cookies filling with your favourite filling. I had to yell at everyone to keep their hands off them until I got at least a couple of decent photos done. And then they didn’t last long. I certainly didn’t have to worry about storage. Baked cookies should be stored in an airtight container for up to 5 days, or they can also be frozen in an airtight container for up to three months. You can also freeze the unbaked cookie dough wrapped tightly in plastic then placed in an airtight freezer bag for up to three months. Pasta Frolla is an Italian pastry dough that is used to make baked goods from cookies to pies. Including these Occhio di Bue. A simple dough made with flour, butter, eggs, sugar and a pinch of salt. Although this dough should be refrigerated for at least one hour before using. What is a good Filling for Occhio di Bue / Sandwich Cookies? If you really want to make them even yummier, dip half of the cut out cookie in melted chocolate, be sure to let it firm up then place it on the filling. So good! 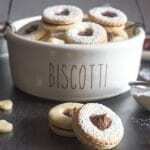 And of course do like the Italians and sprinkle some of the top cookies with powdered sugar before placing them on the filling. I used these Tescoma Cookie cutters to make the perfect size cookies and cut outs. I also brought my dough together with my Food Processor. You could probably use a stand up mixer with the paddle attachment, unless of course you want to get those arm muscles working and do it all by hand! 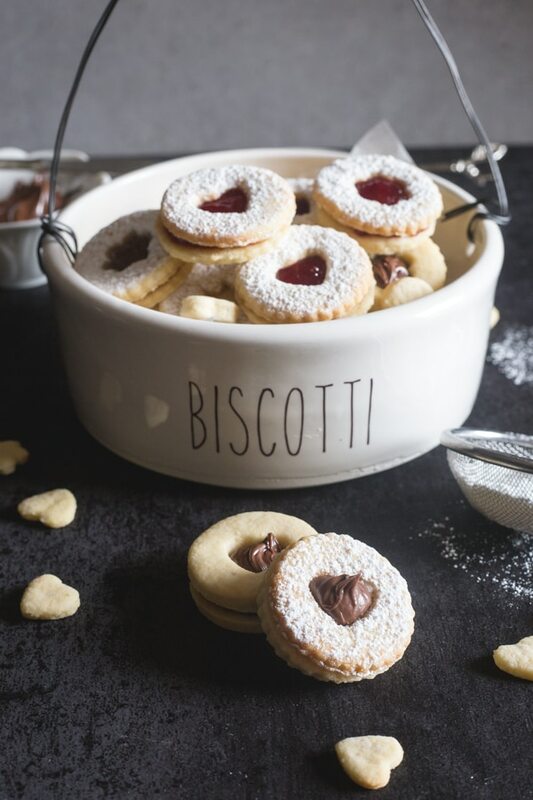 They Italian Sandwich Cookies are a delicate flavour, with just the right amount of richness, but my oh my they are so worth it! You’ll just have to try it in order to understand! Enjoy! 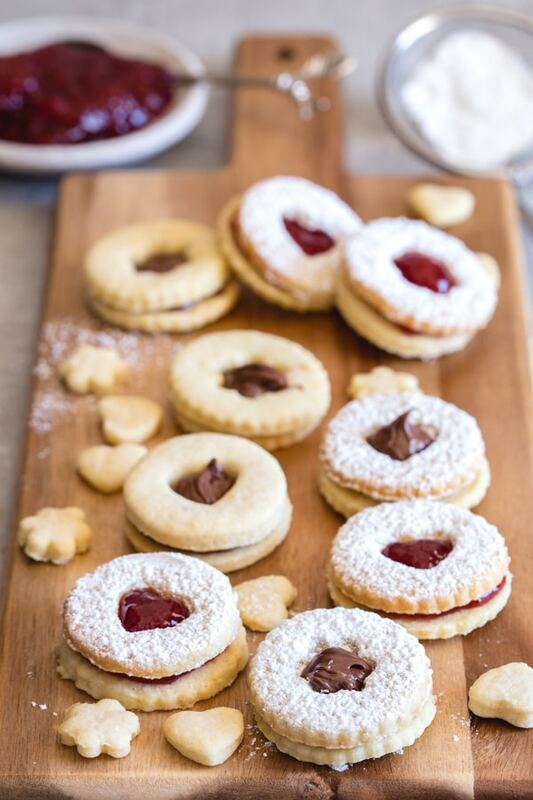 Italian Sandwich Cookies a thin buttery cookie filled with your favorite filling, from a creamy Hazelnut filling to your favourite jam. Using either a (Food Processor, stand up mixer or by hand) add the flour and salt to the bowl, make a well in the flour and add the eggs, lightly mix (pulse, with a fork or beat just to wet the flour), add the sugar and mix, then add the chopped butter and mix to form a smooth compact dough, wrap in plastic and refrigerate for an hour. Remove from the fridge and knead a few times to soften up the dough. 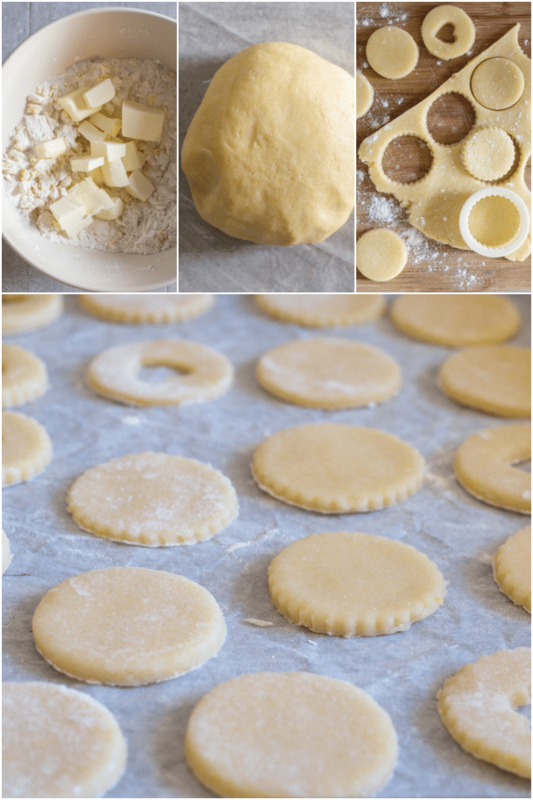 Using a small round cutter (1.5 inches / 4 cm) or glass form cookies slightly thicker than pie dough (1/8 inch see photo). Leave half the cutouts whole and the other half cut out a small form in the middle (heart, round shape, star etc*). Pre-heat oven to 350 degrees (180 degrees celsius). Line 2-3 cookie sheets with parchment paper. Place cut out circles on a parchment paper lined cookie sheets and refrigerate approximately 15 minutes while oven is heating. Bake for approximately 10-15 minutes or until very lightly golden. Let cool completely , dust the cut out cookie with icing sugar if desired. Place filling (1 teaspoon more or less of desired filling) on whole cookie and cover with the cut out cookie. Serve. Enjoy! *Be sure to bake the small cut out forms on a separate cookie sheet because they only take about 5-6 minutes to bake. Updated from August 17, 2014. Hello, do the eggs need to be boiled or are they raw? Hi Pavan, the eggs are raw. I hope you enjoy them. Thanks very much, and thans for the great link up party, just added my link! Great recipe, I’ll be featuring it tomorrow at the Bewitching Projects Link Party ! 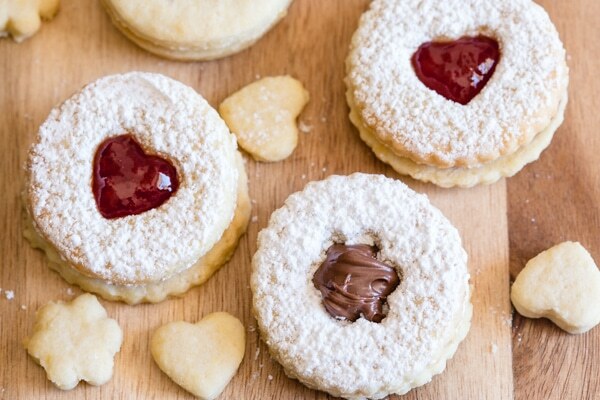 Thanks so much for featuring my Italian sandwich cookies! !